What do you want from your Lake George NY wedding photographer? 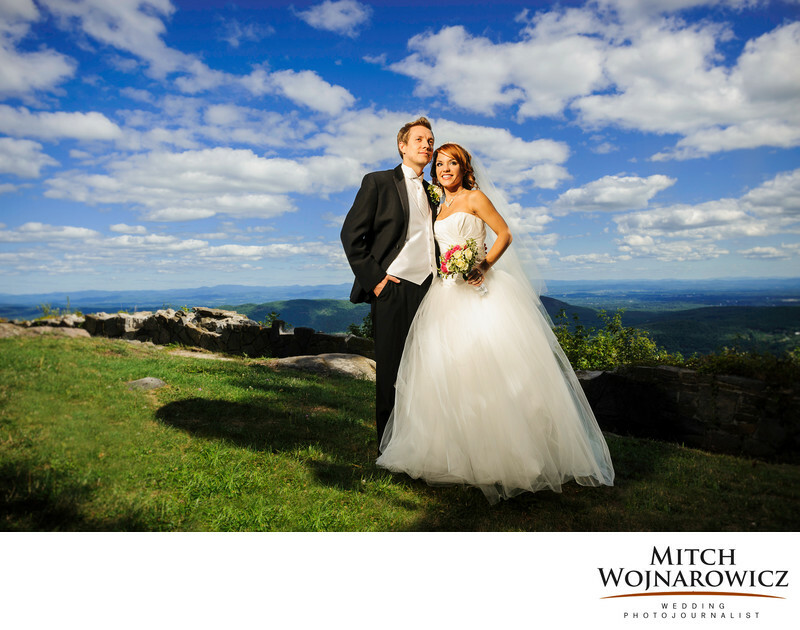 Is it beautiful, natural wedding photos like this one of a bride and groom at the top of Prospect Mountain? Or are you looking for a more traditional approach to wedding photography. A traditional approach means more posed photos, with you spending more time from your wedding day taking lots of group photos. Do you want someone who can use lighting well, such as was done for this image? Or are you looking for someone who only does natural light wedding photography? That usually means you’ll have very washed out looking images as so much of the wedding day takes place during the middle of the day which is very bright. And photographers who have no skill at using lighting when needed will be at the mercy of very light or very dark conditions. As a Lake George NY wedding photojournalist, my work centers on bringing back photos of interactions, emotions,a sense of place. In other words, very natural wedding photos where you look your best but you still look like yourself. And not someone posing in some odd way for no apparent reason. So take a look at my Lake George wedding photos on my website and my blog. You’ll see people being happy, interacting with family and friends. Being themselves. You’ll also see posed photos too, such as bride and groom portraits in Lake George as well as family group photos. But those posed photos aren’t the bulk of the wedding photos I created from those events. And they didn’t take up hours and hours of the couple’s time on their wedding day. Here are some of my favorite wedding venues from my work as a Lake George NY wedding photographer. There are so many options available as there are smaller camps and private homes that are for rent as well. So explore a bit and you’ll find great options for Lake George NY wedding venues. It’s a great golf course that has a stunning sunset view over the lake. It’s a bit smaller and definitely more intimate than some of the big open ballrooms. But it’s unique! There is a farmhouse style restaurant which is great for smaller and more intimate weddings in Lake George. There is a tent outside for bigger parties. But the key is the view. It’s one of the best spots for wedding photos on Lake George and it’s right outside your wedding reception door! The mighty Adirondack-camp style hotel has sweeping access to the lake for a lakeside wedding on Lake George. Beautiful buildings, beautiful scenery. One of a kind. There is the big historic hotel building. It has great views, lawns and locations for your wedding photos. There is a fantastic spot to have a lakeshore wedding on Lake George. Down by their beachfront and docks, there is a great Adirondack Mountain view. And during the warm months, there is the great lawn in front of the hotel which evening light sweeps across, providing a beautiful location for couples photos. It’s a downtown Lake George wedding venue with great views over the lake. It also has great access with a short walk to the lakeside for photos! The ballroom is beautiful. And across their back yard and down some steps is the downtown Lake George lakefront. Later in the day it gets great light and is a perfect location for making couple’s wedding photos on Lake George NY. The bonus is the historic and dramatic view into the Adirondack Mountains. What else do I need to say? You get on a larger lake cruise boat, the captain, if you want, can marry you, and you and your guests cruise and watch the changing Adirondack scenery with a front row view of it all. It’s a unique Lake George NY wedding venue and one of the best Adirondack wedding venues. You cruise into the evening surrounded by the mountains then covered by the stars as the evening unfolds. There is a lot of deck space as well as space along the rails of the boat for everyone to enjoy the scenery, smoothly cruising this Adirondack lake. Another front row seat for a beautiful Adirondack lakeside wedding. Views, access to the water, the rustic Boathouse restaurant. It’s a quaint setting! Beautiful, beautiful lakefront spot for a wedding ceremony. Dramatic and stately main lodge building. Top flight ballroom. It’s a stunning spot. A wedding on the point at the Inn at Erlowest is one of the spots where you can truly be right on the edge of the water with a beautiful Adirondack Mountain view. The steamboats pass, the water washes against the shore, the late day sun illuminates the mountains. It’s an idyllic location for a lakeside wedding on Lake George NY. You’re not going to be pestered. Or get a ton of emails. But I’d like to speak with you to find out a little about what your’e planning for your Lake George NY wedding. Just Click This Link To Get In Touch. We can speak directly a bit about your wedding, or maybe email each other. I can offer some expert tips and planning advice learned from photographing hundreds and hundreds of weddings. It would be great to get to know more about you and your wedding day. And to see if I’m the right photographer for you.